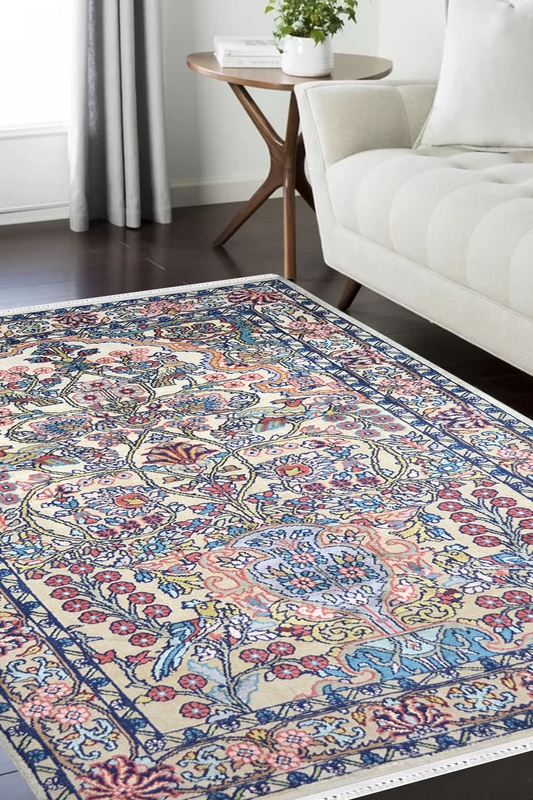 Bring some warm touch and give a cosy feel to your home this winter by placing this beautiful handmade silk on cotton carpet. This handmade rug is beautifully handcrafted by our talented weavers in India. This is ideal for living room and bedroom and can also be used as a wall hanging. - Pure silk and cotton are completely processed by hand to create the yarn that contributes to the weave this beautiful carpet. - This carpet has taken approx. five to six months to weave. - This carpet contains "one of a kind" design pattern including multi colors. - It contains very traditional and famous design pattern which is called Tree of life. - This design is inspired by a vase which is filled with flowers and has been originated from Persia in 17th century.